Britons are not getting enough vitamin D and should boost their intake with supplements because of the lack of sunshine, government health experts have suggested. The bleak British weather is stopping much of the population from receiving healthy amounts of the essential vitamin from sunlight and natural food sources alone are not enough to boost levels, they added. The Scientific Advisory Committee on Nutrition (SACN) – a group of experts that advise the government – is proposing a dietary intake of 10 micrograms of vitamin D per day for everyone aged over one year. The current Government advise is that only at risk groups, including pregnant women, babies and adults aged over 65, need to take supplements. If SACN’s draft recommendations are adopted it could lead to new guidance affecting the whole population. ‘Before this the general assumption was that adults were able to make all the vitamin D they needed from sunshine , and didn’t need any dietary or supplementary intake, Dr Adrian Martineau, an expert on vitamin D at London School of Medicine and Dentistry told the Independent. ‘SACN was right to say that we can’t rely on sunshine in the UK to meet the Vitamin D requirements. Vitamin D is made by the body under the skin when it is exposed to sunlight. However, it can be found naturally in egg yolks, oily fish and wild mushrooms. A deficiency can cause problems when there is not enough of the vitamin to properly absorb the required levels of calcium and phosphate. Mild to moderate vitamin D deficiency can lead to bone pain and weakening of the bones – osteoporosis – which increases the risk of fractures. 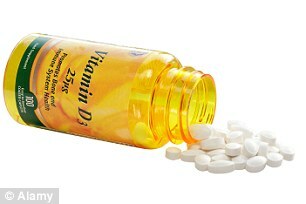 The Draft Vitamin D and Health report said: ‘It is proposed that the recommended nutrient intake is applicable throughout the year, as a precautionary measure, to cover population groups in the UK identified to be at risk of minimal sunshine exposure as well as unidentified individuals in the population with minimal sunshine exposure who would be at risk in summer. The final report from the SACN will be reported after a consultation period ends in September. If the the report is adopted it is likely to lead to an increase in the sale of Vitamin D supplements and see an increase in products being fortified with the vitamin. Professor Hilary Powers, chair of the SACN Vitamin D working group, said: ‘It is important to remember that this vitamin D report is a draft so the recommendations may change after the consultation period. Vitamin D has several important roles – for example, it helps control the amount of calcium and phosphate in your body, which are needed to keep your bones and teeth healthy. Having too little vitamin D (a deficiency) can damage the way your body absorbs calcium and phosphorus. Without adequate vitamin D, bones can become thin, brittle and misshapen. In extreme cases this can lead to rickets in children, a condition involving a softening of the bones that can lead to fractures and deformity. In adults softening of the bones is usually called osteomalacia, and may cause pain and muscle weakness. Vitamin D may have other important roles in the body including regulating cell growth, neuromuscular and immune function, and reduction of inflammation. Even years after its discovery, there is still ongoing research examining the various other functions vitamin D might perform in the body. According to the Scientific Advisory Committee on Nutrition (SACN) – a group of experts that advises the government about all aspects of nutrition – some evidence suggests that vitamin D may be important in preventing other diseases including cancer, cardiovascular disease and multiple sclerosis, although it points out further research is needed before any definite conclusions can be drawn.